Former president Benigno Aquino III, Liberal Party president Sen. Kiko Pangilinan, human rights lawyer Jose Manuel Diokno, former Bangsamoro Transition Committee member Samira Gutoc, Vice President Leni Robredo, LP internal affairs VP Lorenzo Tañada III and Sen. Bam Aquino join hands at the party’s National Executive Council meeting in Quezon City yesterday. MANILA, Philippines — The Liberal Party (LP) yesterday announced its initial candidates for the May 2019 senatorial elections, led by reelectionist Sen. Paolo Benigno “Bam” Aquino IV. 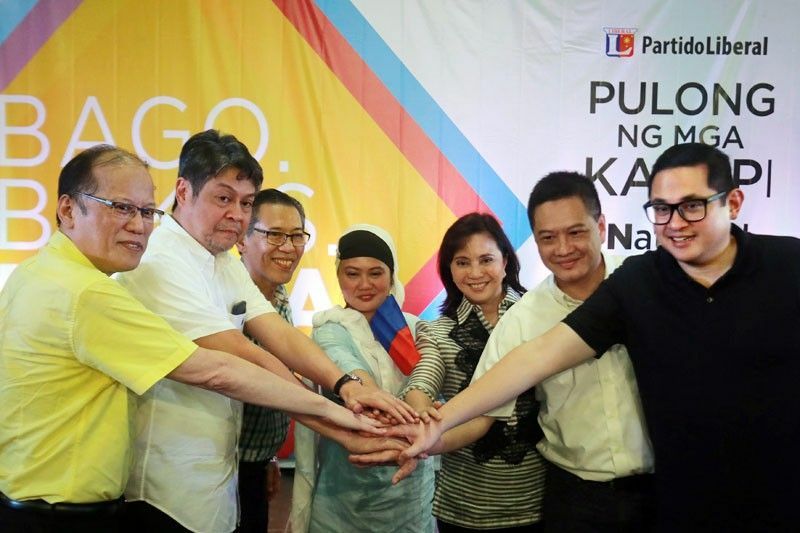 Aquino, along with human rights lawyer Jose Manuel “Chel” Diokno and former Quezon congressman Lorenzo “Erin” Tañada III, were formally nominated as the LP’s initial Senate bets during the party’s National Executive Council (NECO) meeting held in Loyola Heights, Quezon City. Among those who attended the meeting were former president Benigno Aquino III, LP chairman emeritus; Vice President Leni Robredo, LP chair; and Sen. Francis Pangilinan, LP president. Pangilinan said the three LP senatorial bets would carry on the legacy of their elders, who were all known freedom fighters and noble statesmen. Bam, who is serving his first term until 2019, is the nephew of the late senator Benigno “Ninoy” Aquino Jr.
Tañada is the son of former senator Wigberto Tañada and grandson of the late senator Lorenzo Tañada. Diokno, chairman of the Free legal Assistance Group and founding dean of the De La Salle University College of Law, is the son of the late senator Jose “Pepe” Diokno. In her speech, Robredo said the three LP senatorial candidates did not inherit the positions but the good names of their elders. “These three names that we introduced to you today have shown their competency, firm belief and dignity in service. Three names who belong to families of heroes,” Robredo said. The three LP senatorial hopefuls failed to make it to the so-called winners’ circle in Pulse Asia’s survey conducted from Sept. 1-7. Aquino, who received a voter preference rate of 20.1 percent, was ranked 18th to 23rd places. Tañada placed 36th to 46th places with a voter preference of 3.4 percent. Diokno ranked 44th to 62nd with a voter preference of 1.6 percent. Only former senator Mar Roxas was included in the list of possible winners in the Pulse Asia poll, garnering a voter preference of 27.7 percent. Roxas, who lost to President Duterte in the 2016 presidential elections, is still undecided on whether to run for the Senate. Robredo also announced the possible inclusion of former Bangsamoro Transition Committee member Samira Gutoc as among the LP senatorial candidates. She said Gutoc quit her post during the drafting of the Bangsamoro Basic Law in May last year after Duterte declared martial law in Mindanao. In an interview after the NECO meeting, Robredo said Gutoc was not included in the initial list of LP’s senatorial candidates announced yesterday as she is not a party member. She said Gutoc was “formally” asked yesterday to join the LP slate and she has expressed interest. Meanwhile, Robredo was unfazed by the LP candidates’ low ratings in the recent Pulse Asia senatorial survey. She said the results could still change in the coming months. The Vice President cited her experience in the 2016 vice presidential race, wherein she started at the bottom of surveys with just one percent voter preference. Meanwhile, Malacañang downplayed criticisms hurled by former president Benigno Aquino III against the administration during the announcement of the LP’s senatorial lineup. “Let President Noynoy Aquino be, that’s his stand, but many still believe that his administration had a lot of failings,” presidential spokesman Harry Roque Jr. said in Filipino. Roque reminded the opposition group led by Aquino and Robredo that it was during the former’s term that the word “Noynoying” was coined by critics to describe the Aquino administration’s failure to address many concerns of the people. “There was a term coined, which was ‘noynoying’, which means ‘doing nothing’ but play video games,” he said, referring to the former president’s alleged pasttime. Roque also debunked Robredo’s claims denying the ouster move against Duterte. Actually, the official said there is no report linking the Vice President to any conspiracy against the President. “Well, as far as VP Leni is concerned, that’s a fair statement, because as far I know, she was not amongst those specifically named to be part of the conspiracy,” Roque said. “She is after all the second highest elected official. She took an oath to support the Constitution and she should not and she’s expected not to support any unconstitutional means to remove the President,” he added. Roque said there are some personalities from the LP who are part of the ouster moves, but that no plot would succeed. He said it is up to the AFP to reveal the details of the alleged plot, adding that they have the intelligence reports.